Very few of us know the history of the Pledge, its author and the original purposes behind the Pledge. Let’s explore some of these issues together. Edward Bellamy (whose father was also a Baptist minister) is attributed with influencing the worldview behind Francis’ political views. Edward wrote novels including, Looking Backward 2000-1887 (1888), a critique of American capitalism and its sequel Equality (1897). Edward depicted the year 2000 as being the date that competitive capitalism would have been stamped out in favor of what he called a “cooperative commonwealth.” The theories in the book inspired many “Bellamy Clubs,” which led to the formation of a Nationalist Party, that advocated the federalization of public services. In 1891, Edward founded the “New Nation” in Boston, an organization that for some time promoted his leftist views. Edward had other interests, such as psychic phenomena, which he explored in some of his writings, but for the most part, he limited his novels to socialist concerns. Inspired by such lofty fascist notions, it seems that Francis was determined to influence the young (as did John Dewey and other socialists of the day), to cause them to have complete unquestioned allegiance to the civil government as the protector and provider of the people. The idea for the Pledge was given as an assignment to Francis Bellamy and Ford’s nephew, James B. Upham. The first version of the Pledge was published in the Sept. 8th, 1892 issue of The Youth’s Companion (TYC) magazine, commemorating the 400th anniversary of Columbus’ discovery of America. Why The Need For A Pledge? There seems to be several major motivations for introducing to youth a national oath or vow of allegiance. First, were Francis’ personal radical views of the government as the cure for all social ills, and the need for unreserved trust and dependence on the State. Second, according to Dr. John W. Baer, the Pledge of Allegiance could be considered by the advertising industry to be “the greatest piece of copy-writing seen in the United States in the last hundred years.” Francis Bellamy spent the latter years of his life as an advertising salesman for various magazines and considered writing ad copy to be his specialty. There was a definite financial motive behind the selling of the Pledge; it was the selling of American flags. Despite all of the rhetoric about socialism, a free press like The Youth’s Companion (which has the constitutional right to promote socialism if it desires), has to raise funds in a very capitalistic manner. When the assignment to write a flag pledge was given to Bellamy and Upham, the former was given the task of writing the piece and promoting it to schools, while the latter was instructed to use the Pledge as a publicity stunt to sell American flags, the newspaper’s latest fund-raising endeavor. By 1892 the publication had already sold flags to approximately 26,000 schools, but Ford was convinced that they had not yet exhausted the market. Ford commissioned his staff to sell a flag to every school in America. The task was to encourage the NEA to tack on an official “pledge to the flag” for the celebration of the then upcoming National Public School Celebration for Columbus Day, thereby ensuring nearly universal participation in flag ceremonies (and thus, flag sales). Third, Upham masterfully played upon the interest of school leaders in increasing patriotism in the schools. W.T. Harris, the commissioner of education, worked with the publication to secure TYC’s management of the World’s Youth Congress at the 1892 Columbia Exposition in Chicago, and convinced the school superintendents in attendance to adopt a series of resolutions recommending the project to all superintendents, teachers and newspapers. Francis was chosen as chairman of the NEA’s executive committee for the celebration. The NEA was intent on ensuring that the Columbus Day celebration was not merely a celebration of the discovery of America, but that the theme also included a recognition of the government schools as the glue which held the American experiment together. Very few private school administrators or homeschoolers are aware of how “eminently” linked the Pledge to the Flag is with the government school system. An interesting effect of this “promotion of patriotism” was that most schools that used to have students memorize and recite sections of the U.S. Constitution, The Declaration of Independence or some other founding document from America’s inception, did away with teaching students what American law says, and focused only on oaths and vows. Now when nearly all students pledge allegiance to the Flag, they think the phrase “wall of separation of church and state” is a stated tenet in our Constitution on which the (Democracy) stands, with tolerance and diversity for all. Early on in American education, the notion was presented that while parents can teach some things (like potty training or brushing teeth), the government was the only agency capable of teaching people to be good citizens, and thus, “for the good of all society”, government schools were an indispensable part of the national economic duty. Fifth, was President Harrison’s desire to further the effort to bring all of the southern citizens into conformity with the goals and agenda of the new federalized Union following the Civil War. Abraham Lincoln in 1863 had recommended an “Oath of Allegiance” for southerners to declare their loyalty to the new United States. Other such pledges and oaths (directed to those living in the formerly Confederate states) developed in following years, but the older citizens of the South resented most of them. Many people are not aware that the original Pledge was devoid of any religious content. Bellamy’s version read: “I pledge allegiance to my Flag, and the Republic for which it stands, one nation, indivisible, with liberty and justice for all.” Notably absent is the line about America being “under God.” The original intent of this Pledge of Allegiance was to give homage to a secular republic. In a June 3, 1940 U.S. Supreme Court decision, Minersville School District v. Gobitis, the court decided that a local school board could expel students who refused to recite the Pledge. On June 22, 1942 during the patriotic fervor of WWII, congress included the Pledge in the United States Flag Code (Title 36). In 1943, one year after receiving this official sanction, the U.S. Supreme Court, in the West Virginia State Board of Education v. Barnette decision (a case driven by religious organizations that felt that pledging allegiance to a flag was a violation of Exodus 20), ruled that school children would not be forced to recite the Pledge in school, a ruling that still stands to this day. I Pledge Allegiance To A Godless-State? Fast forward to the present and we find ourselves in a culture that wants, ironically, to roll back this pledge to the original intent of Francis Bellamy, the author. Modern-day leftists desire to teach children to pledge their faithfulness and loyalty to a God-less State. This is something that must never happen. A lawsuit brought by an atheist parent in Sacramento, CA against the words, “under God” in the Pledge was upheld in the 9th Circuit Court of Appeals case, Newdow vs. U.S. Congress on February 28th, 2003. This case is destined to be decided, at some point, by the U.S. Supreme Court. The claim made by the atheist parent is that Christians are imposing their values on non-Christians by forcing them to acknowledge God (even though no child is forced by law to recite the Pledge). The U.S. Solicitor General, Theodore Olsen, and Elk Grove School District Attorney, Terence J. Cassidy, defended the teacher-led recitation by insisting that the phrase, “under God” was merely “descriptive” and “ceremonial” rather than a “religious invocation.” In other words, you can use the words “under God” as long as you don’t mean them. Sort of like the Ten Commandments cases where you can display God’s Word publicly, as long as you don’t believe it is God’s Word. It can only be considered an historical document in the same category as the Gettysburg Address or a speech by Dr. Martin Luther King, Jr.
Do you mean the geographical land on which you live (i.e. Papua New Guinea or Greenland)? Do you mean your fellow countrymen (i.e. your neighbors and others in proximity to you)? Do you mean a philosophical ideal or the laws that your nation represents (i.e. freedom of speech, press and religion, etc.)? Do you mean the government that enforces the ideals and the values of your nation (i.e. the monarchy, the parliament, the congress, the police, the military, etc.)? What then, are people pledging to be loyal to when they make a vow to their flag? What is encompassed in that pledge? What if there is a disconnect between the ideals of a nation and the implementation of those ideals? Another consideration is what would you do if you were to move to or were born in Germany, Northern Sudan or Abu Dabi. Would you pledge allegiance to any land where you were born or are a current citizen? You would want to be a loyal citizen, wouldn’t you? Biblically speaking, it would be hard to imagine making a pledge of loyalty to any part of this geographical earth. That would seem odd. We may cultivate and tend it, but not make oaths to it. We are certainly instructed to love our neighbors, but there is no Biblical instruction to vow our devotion to them (our husband or wife, yes, but not our neighbors). Again, the Scripture never tells us to pledge allegiance to a set of ideals or philosophies, except of course to God Himself, but He is not, of course, merely a set of ideals. Romans 13 instructs us to be subject unto the higher powers, but history certainly doesn’t record the early Christians pledging allegiance to Caesar. Why? Because Caesar had set himself up as a god to be worshipped instead of the true and living God. They paid taxes and they showed honor when honor was due, but they did not pledge to do whatever Caesar wanted them to do. May I submit to you that those who wish to remove the words, “Under God” from the Pledge are explicit in their desire to eradicate any notion of the civil government’s obligation to a Higher Authority? They want to keep the oath, but they want you to be loyal to them, not to God. That act of autonomy, along with other recent public proclamations (such as the removal of Ten Commandments monuments from public courthouses), reveals the worldview or political philosophy by which most of our nation’s leaders now stand; “one nation, out from under God.” I can assure you that a nation like that will not have liberty or justice for all. The issue is not merely one of vanishing religious symbols or the privatization of faith, although it certainly is both. It is a statement about the belief of our government officials that there is no Supreme Being to whom they are accountable. That, my friends, is frightening. How many Terri Schiavo cases do we have to see, hate-crime laws passed or pre-born babies murdered to be convinced that there is not, actively, “liberty and justice for all”? How many pro-homosexual “marriage” laws must be passed before we concede that this is not a nation under submission and obedience to Almighty God? Government becomes perverted with the weight of its own power and its citizens must not give unquestioned allegiance to any ruler or State. (Remember Hitler, Stalin and Saddam Hussein?) “Both Upham and Bellamy agreed the new words for a salute should be more than just a Salute, it should be a vow of loyalty or allegiance.” (Baer) We must not encourage our children to trust a government that is disobedient to God’s Word. Yes, we render to Caesar what is his, but only what is his. We do not owe Caesar all that we are – that belongs to God alone. And the devil, taking him up into an high mountain, shewed unto him all the kingdoms of the world in a moment of time. And the devil said unto him, All this power will I give thee, and the glory of them: for that is delivered unto me; and to whomsoever I will I give it. If thou therefore wilt worship me, all shall be thine. And Jesus answered and said unto him, Get thee behind me, Satan: for it is written, Thou shalt worship the Lord thy God, and him only shalt thou serve. On March 11, 2005, the We Are Family Foundation (a non-profit organization with direct ties to many pro-homosexual groups) distributed a video to 61,000 government and private elementary schools for what was called, “We Are Family Day.” The video featured many popular cartoon characters singing and dancing to the popular disco hit, “We Are Family.” It seemed harmless enough (as if any such massive campaign could be innocent! ), but as you might suspect, there was a sinister motive. Government schooling has always, from its inception, had the intent of creating a certain type of citizen. Schools are becoming increasingly confident in their ability to shape the beliefs and values of the young. The real heart of the matter is the struggle over which side gets to define the terms. The leftists say that you are hateful if you lovingly spank your children. According to Proverbs 13:24, refusing to physically discipline your children is a hate-crime. According to leftists, you are committing a hate crime if you tell your neighbor that he is wrong to be living a homosexual lifestyle and that he needs to repent. The Bible says in James 5:20 that if you do this you are being loving. The above pledge may sound good until you realize what they mean by the words they use. There are tolerance and diversity pledges like the ones discussed above, and the ever increasing push to swear allegiance to being a citizen of “one world” in the new global society (remember Michael New who was court marshaled because he refused to swear an oath of allegiance to the United Nations while serving in the U.S. Military?). 1. John Taylor Gatto, The Underground History of American Education, (New York, NY, The Odysseus Group, Inc., 2001), p. 128. 4. Dr. John W. Baer, The Pledge of Allegiance: A Centennial History 1892-1992, by, (10 Taney Avenue, Annapolis, MD 21401), 1992. 9. Samuel Blumenfled, The History of Public Education, an essay printed in PHS #30, 1999. Copyright 1993-2004 Home Life, Inc.
10. Family News From Dr. James Dobson, February 2006, Focus on the Family, Colorado Spring, CO 80995. Israel Wayne is an author and conference speaker and Director of Family Renewal, LLC. Care to share your “homemade” pledge with us, please, as I’m not as interested in teaching my homeschooled children the pledge of allegiance as I was before i read this article, thank you. Josiah, like Dean B. said below, I too would love to see the whole pledge you wrote. Good points. 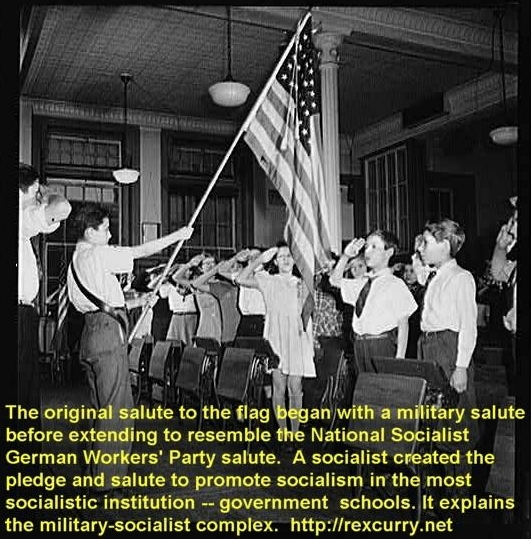 The USA’s early Pledge of Allegiance salute was not an “ancient Roman salute” as the ancient Roman salute is a debunked myth. The concept of the Roman salute did not even exist until around the 1920’s (see the work of Dr. Rex Curry and also the Oxford English Dictionary for proof of how recent the phrase and concept “Roman salute” is). The painting “Oath of the Horatii” does not show the “ancient Roman salute” and the painter never used that phrase or concept, as that phrase/concept did not exist at that time. The painting shows three people reaching for weapons and two of them are using the left hand. Similarly, Francis Bellamy (author of the Pledge of Allegiance in 1892) did not use the phrase/concept “ancient Roman salute” as that phrase/concept did not exist during the time that Bellamy created the pledge (1892). 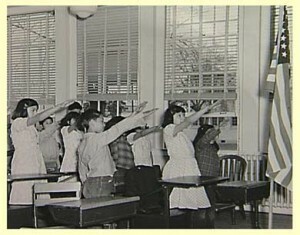 Bellamy clearly explained the origin of the early pledge salute (a military salute extended outward to point at the flag). In practice the second gesture was performed palm down by disinterested children forced into the robotic daily chanting ritual. Francis Bellamy was from Rome, New York (not Rome, Italy). The Oath of Horatii lie was created by liars on Wakipedia after the liars were exposed when wikipedia previously lied that old Roman statues showed the ancient Roman salute, and all those wikipedia lies were deliberately manufactured in an effort to hide the truth that was exposed by Dr. Curry (that the USA and the Pledge of Allegiance is the origin of the Nazi salute and of Nazi behavior). Francis Bellamy and Edward Bellamy (cousins and cohorts) were American national socialists who influenced German national socialists (nazis). The USA and the Pledge continue to be the source of Nazi behavior. The USA has been, and continues to be, a police state. Stop the Pledge. Josiah~I would love to get the whole pledge you wrote up….We homeschool our kiddos, too and think something like that could be beneficial. Israel~excellent article. I’ve never researched the history behind the pledge, so thank you for your work and putting this out there. Yes indeed, you were raised up on flag-waving propaganda to pledge allegiance to a Symbol (a symbol which Christian churches put on their platforms and courtyards as if the State is King instead of Christ; or the allegiance of the church is to the State’s arbitrary power). We used to joke about the Pledge in school, altering the words, because it FELT tyrannical to be made to recite it with “hand over heart”! Talk about dictatorial! (But this is why the republican establishment reinforces this symbolism, and especially “under God”, to get Christians to “go along” with the Party of Lincoln). **Meanwhile the oaths of office for Presidents and Congress and Judges is to the Constitution! They swear to “defend and uphold the Constitution of the United States”. Why is the public not led in a Pledge like that instead, like they do? (Not saying we should necessarily; making a point). And do they obey the Constitution, or uphold THEIR OATHS? No! But you must make this politically-correct Pledge, which is also unconstitutional, to a “republic for which it stands”, a “One Nation” (instead of Federal government, of independent sovereign states) government? Note the difference? The Pledge is pure propaganda and unconstitutional indoctrination, that began at Reconstruction, which is its purpose–i.e. to consolidate Power in Washington over the states, no secession permitted. Any tyrant can get you to follow him using the Flag then, if your “allegiance” is to a Flag, can’t he, or she? (Note Bush’s propaganda use of the flag after 9/11, to justify the most Unconstitutional measures of “Homeland Security” and so-called PATRIOT (surveillance) ACT, the beginnings of Totalitarian Security State, where natural born citizenship is not enough without REAL ID either, to prove you are a “worthy” submissive servant of the State with your “papers”. It was for this reason that even the non-Christian cult Jehovah’s Witnesses, after much persecution in West Virginia, won a court case on this FOR JUST CAUSE, against reciting the Pledge in classrooms, for which they were villified, mocked, and rocked, WHILE CHRISTIANS BLINDLY FOLLOWED SUIT WITH IT, as a form of fake righteousness! That was a landmark legal case, permitting individual dissent for ‘religious conscience’ and reasons to not participate in the Pledge (but not without social consequences, especially by blind modern Christianity, which thinks it a symbol of righteousness). Therefore, you even have LAWFUL Christian Liberty under the Constitution, to dissent from being forced to recite it, and should according to the First Commandment (God’s authority is First)! The phony pledge was to justify the New Consolidated Government, a Union by Force, after the Southern States were coerced back in at gun-point. Ask yourself just how free Americans can really be under a Union by Force, instead of free consent of their states. Many refused the “oaths of allegiance” and stood their grounds against it too. The Pledge itself is an unconstitutional and coerced Oath that is forced and not free, and salutes reverence and submission to Arbitrary Power, because that is all a flag or symbol represents, not the Constitution. World Nations come and go. Wax and wane in power, and in integrity. A larger kingdom, a higher allegiance, my first allegiance. Thus, all other allegiances I hold–such as to my country–I will uphold as long as it does not cause a disloyalty to my “homeland”–the Kingdom of God. I pledge allegiance to Jesus Christ, the King of the United States of America, & to the republic submitted to His Word, one republic of state, under Christ, divisible, with liberty & justice for all. Awful, simply awful. You ought to be ashamed of yourself. Remember, God will not be mocked. This is just as bad since we should not pledge or make oaths. Did you not read the article? I just read this article, I have been thinking the same thing for a while now. I agree with the writer thank you for writing this. I will only pledge my life to Yeshua/Jesus. Please forgive me God for unknowingly pledging to the flag and nation. Set all your children free from this deception. As we grow in our relationship with you and our Eyes are open So we can live by your ways. Thank you for the article. I totally agree and have been thinking about this lately. Our only pledge (vow) should be to our creator, God. The only Allegiance I pledge to is Yahweh/God! I am Glad to see an awareness to this folly. years back I was working together with an America ministry and at time I remember they wood do this pledge to America thing, it was so strange to me I would experience such a grieving of the Spirit! Along with them practicing this sham-full act they also believed this heresy that they were Gods one and only representative nation.I have herd this from many other so called christian ministry’s.